The Group Pen Respiratory Scoring App was developed at the University of Wisconsin School of Veterinary Medicine. 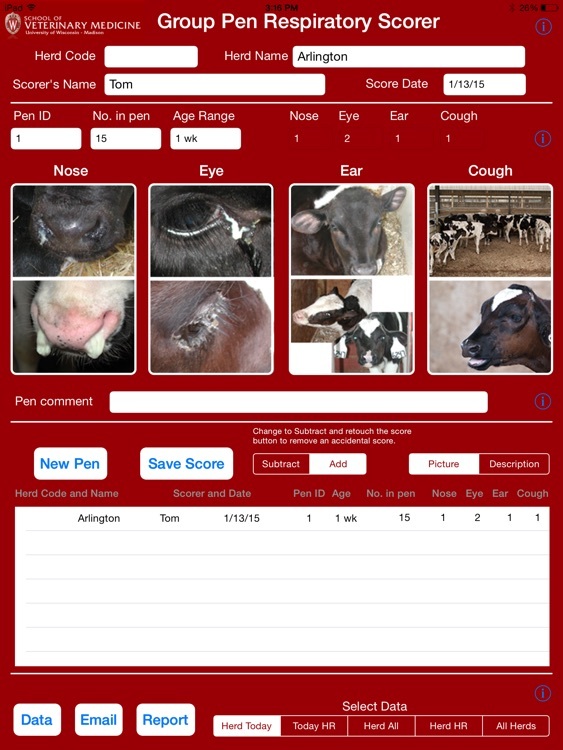 The app uses a graphical interface to score group pens of young stock based on the respiratory scoring method developed and employed by Dr. Sheila McGuirk and Dr. Theresa Ollivett. The categories scored are nasal discharge, ocular discharge, ear or head tilt, and coughing. Group pen scoring output determines disease of the group of animals in addition to individual animals. The group would be classified as having respiratory disease (high risk) if 25% or more of the animals in the pen/group were abnormal in 2 or more of the categories scored. Affected individual animals will have 2 or more abnormal categories. 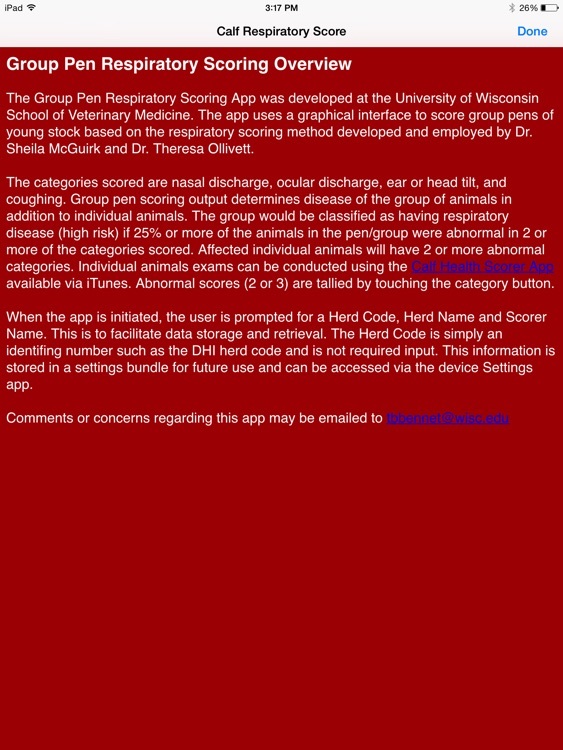 Individual animals exams can be conducted using the Calf Health Scorer App available via iTunes. Abnormal scores (2 or 3) are tallied by touching the category button. When the app is initiated, the user is prompted for a Herd Code, Herd Name and Scorer Name. This is to facilitate data storage and retrieval. This information is stored in a settings bundle for future use and can be accessed via the device Settings app. To enter the Pen ID to be scored, touch inside the Pen ID text field. Type the pen identification and when finished, touch Done. The No. in Pen text field will automatically be selected for data entry. 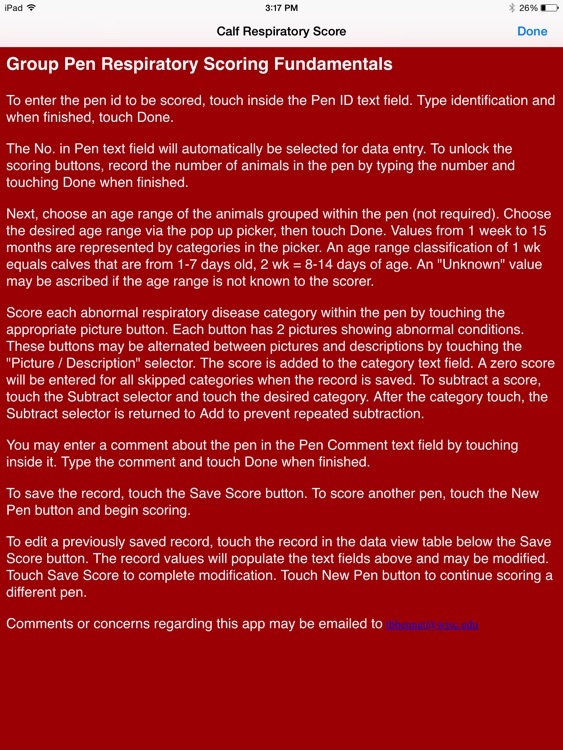 To unlock the scoring buttons, record the number of animals in the pen by typing the number and touching Done when finished. Next, choose an age range of the animals grouped within the pen (not required). Choose the desired age range via the pop up picker, then touch Done. Values from 1 week to 15 months are represented by categories in the picker. An age range classification of 1 wk equals calves that are from 1-7 days old, 2 wk = 8-14 days of age. An "Unknown" value may be ascribed if the age range is not known to the scorer. 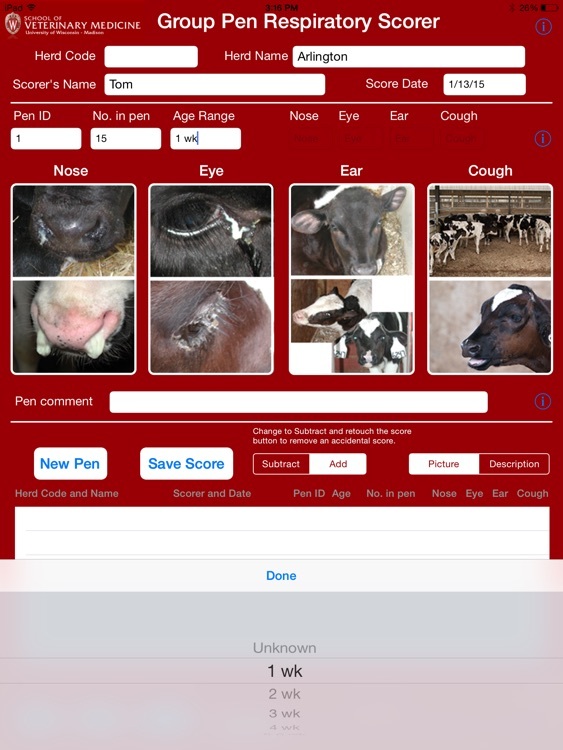 Score each instance of the respiratory disease category within the pen by touching the appropriate picture. The score is added to the category text field. 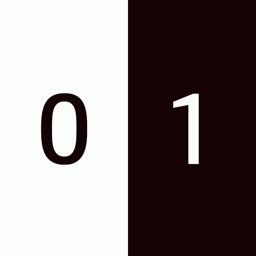 A null score will be entered for all skipped categories when the record is saved. You may enter a comment about the pen in the Pen Comment text field by touching inside it. Type the comment and touch Done when finished. To save the record, touch the Save Score button. 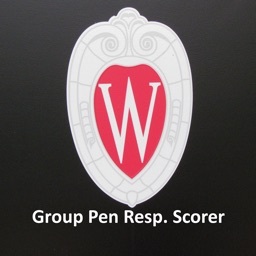 To score another pen, touch the New Pen button and begin scoring. 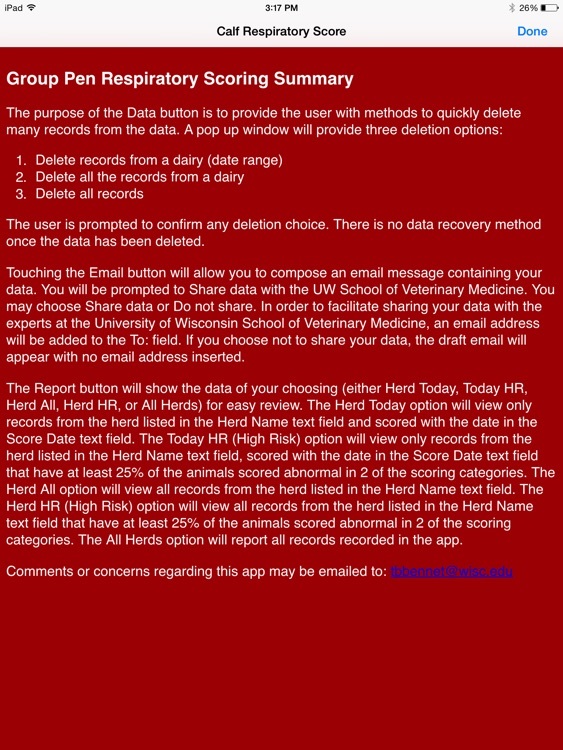 To edit a previously saved record, touch the record in the data view table below the Save Score button. The record values will populate the text fields above and may be modified. Touch Save Score to complete modification. Touch New Pen button to continue scoring a different pen. Data can be emailed or copied to use outside the app.